Join the movement to change the world! The time is now to take your place as the creator of your life! Spiritual awakening is a political act that can change your life, and the world. Our individual dream and our collective one. A Spiritual R-Evolutionary Understands - We are one...one being...one spirit...one consciousness...one life...one love...one creator...transcend the illusion of separateness. understands that the ultimate political action is to awaken spiritually. understands that a world of spiritually awakened beings is politically challenging to current institutions. understands living life as a conscious & loving citizen of earth. understands that we are all aspects of the same spirit and thus to harm another is to harm ourselves. understands that one person hungry is being hungry ourselves. understands that all the children are our children. understands that the truth of who we are is in the stillness of the silence. understands the Natural Laws of Creation. understands their responsibility as a conscious and awakened co-creator of this universe. understands the importance of being a conscious & loving guardian of whatever money is in their custody. understands the implications of many awakened souls becoming guardians of as much money as possible so they may utilize the energetic exchange of money for the conscious good of all. understands, with compassion, the limited human consciousness and dedicates energy to transcending all that limits their awakening. understands that every moment becomes another opportunity to love, create & manifest. understands that every breath, thought, emotion, action, word is an energetic investment in an intention of creation. understands that miracles and visions are ordinary occurrences. understands that there is an ever expanding understanding of what it means to be a Spiritual R-Evolutionary. Join our FaceBook Group, and Make the Manifesto Pledge. I wrote this song with my husband Kevin Wood. 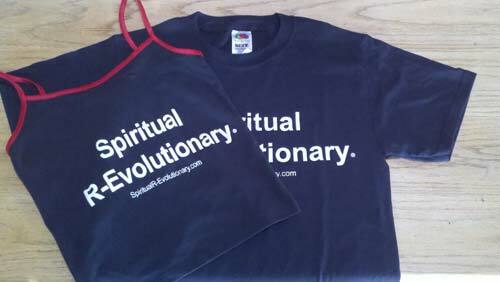 Become a Spiritual R-Evolutionary Wear your talk - spread the invitation! Wear your talk - spread the invitation! Join our Elist to Recieve Updates about this project! If we continue along the path of our busy survival-oriented lives, whether we are focused on literal physical survival or maintaining our desired level of comfort and wealth, we run the risk of becoming disenfranchised from ourselves, our internal and external power and from spirit. We will not be able to join the Spiritual R-Evolutionary march for change and transformation so needed in our lives and on this planet. We will be too busy surviving and consuming. Think of how much of our time is consumed by survival: financial survival, physical survival, technological survival, political survival, and emotional survival. How can we maintain the Spiritual R-Evolution of our being when we are so disabled by our busy-ness and by the fear that accompanies preoccupation with survival on any level? How might our lives be different if we committed more time to the experience of love and developing and navigating the frequencies of conscious spiritual awareness? Realistically our physical survival warrants our time and attention however when it dominates and becomes the defining aspect of our lives, we live out of balance with the vibratory levels of expanded planes of consciousness and spirit. We lose touch with the experiences necessary to support life in connection with our spiritual being. When the busy-ness becomes a lifestyle preventing us from having periods of stillness to tune in to the frequencies in harmony with Natural Law, it becomes an unnatural and dis-empowering way of living. Life as we live it in western culture leaves us numbed by extreme consumerism and the expectation of instant gratification. Our lives are dominated by the mainstream archetype of the way too busy and stressed drone running like a hamster on the wheel. This illusion of getting somewhere keeps us willing to settle for a crumb rather than going for the entire pie. Money and time have become symbols of wealth. Time has become a commodity that can be bought and sold and is highly valued in the marketplace. When something becomes scarce we feel gratitude for possessing the tiniest morsel of this rare commodity, and we protect our morsel with all of our might. Living like this leaves us only able to receive and transmit the densest and lowest of frequencies of reality. We are so distracted by the internal and external noise that we rarely spend any time in the silence. The doorways to the experiences and skills necessary to expand consciousness, and navigate alternative frequencies and dimensions become closed to us. Spiritual awakening and designing a life that includes tuning in and transmitting higher frequencies of consciousness is the whole pie. A life designed around only physical survival is the crumb. When we are fully committed to awakening spirit we prioritize having more free time and creating empty space within us by sitting in silence. These become important line items in our financial and life budgets. Why settle for crumbs when we can have the whole pie? Why settle for a life of dis-empowerment when we can live as the powerful creators we are?